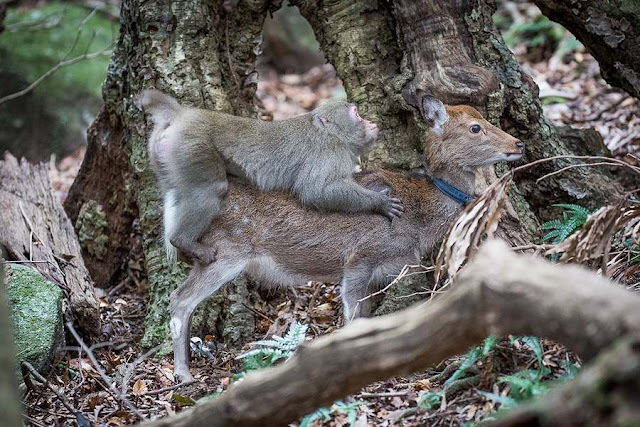 On Japan’s Yakushima Island, macaque monkeys and sika deer have developed a symbiotic relationship: the deer eat fruit dropped from trees by monkeys, and tolerate the monkeys hitching rides on their backs. But it turns out the occasional monkey attempts to take things further. Scientists from France’s University of Strasbourg have captured footage of a young male trying to mate with female deer on two occasions. While the first doe simply shook him off, the other “accepted the mount”, said lead study author Marie Pelé. “No ambiguity is possible; it is clearly sexual behaviour.” In a paper published in the journal Primates, the researchers attributed the monkey’s antics to “mate deprivation”, caused by his low status in the group. Cases of sexual activity between members of species that are not closely related are rare but not unheard of: in 2014, Antarctic fur seals were documented forcing themselves on king penguins (and in one case, then killing and eating it).